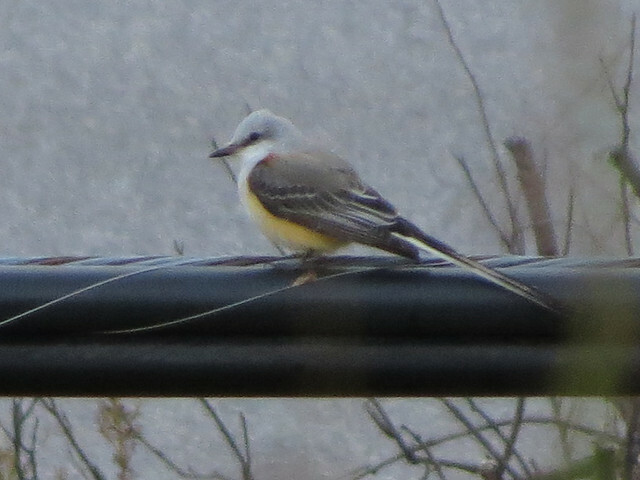 On October 19th, while Arthur and I were visiting my parents in northern Illinois, a Scissor-tailed Flycatcher was reported at the Willow Hill Golf Course in Northbrook. As this was just about 30 minutes from my parents house, we hopped in the car and headed out for the bird, which would be a lifer for us both. The bird proved easy to find, and though the sun was close to setting, I managed to take a record shot. I had set a little goal to try to find 100 species of bird in Lake County for the year. I had gotten to 83 in May and by October 19 I still needed two more birds. As we set off for the Northbrook flycatcher, I had it in my mind that I’d be adding not only a lifer, but a county bird, too. Northbrook borders Lake County but as we drove across Lake-Cook Road on our way to the golf course I realized the flycatcher was firmly in Cook County. Three miles firmly. A crazy county-birder thought, yes, but I was a little bummed as we crossed into Cook. 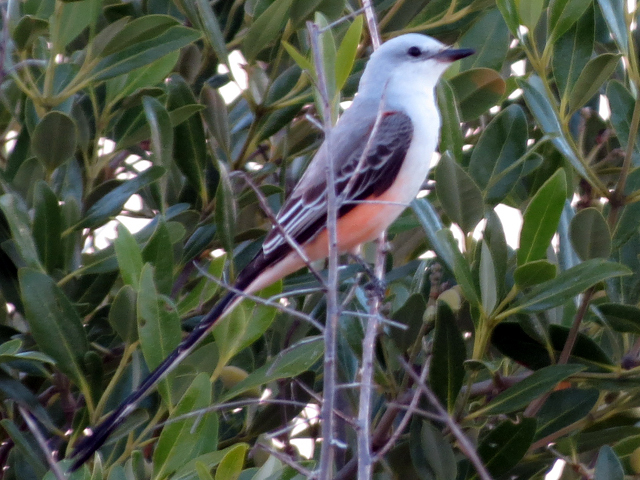 We returned home at the end of October, and on November 2nd I was happy to learn that a Scissor-tailed Flycatcher was seen in a Volusia County portion of Merritt Island NWR. Arthur and I headed out late in the afternoon the next day. We didn’t know exactly where to go but thanks to some help from a pair of extremely nice birders who were on the same twitch, we were able to see the flycatcher. Again it was late in the day and the light was poor, but I managed a record shot. I had been using BirdLog to enter my bird sightings as we walked from the parking area to the spot where the flycatcher was seen. In the end my list had 21 species on it. I asked Arthur to mark the spot where we saw the flycatcher using his iPhone map. ARGH!! I had to split my eBird list. Twenty for Volusia. The flycatcher was .4 miles over the border, in Brevard. Bummer x2. This entry was posted in Florida, Illinois, Life List, Volusia Birding. Bookmark the permalink.